A survey conducted by the Swiss organization ICERTIAS (International Certification Association) has revealed that the majority of Maltese consumers picked the mobile telephony services provided by Vodafone Malta as offering the best quality service in relation to price. 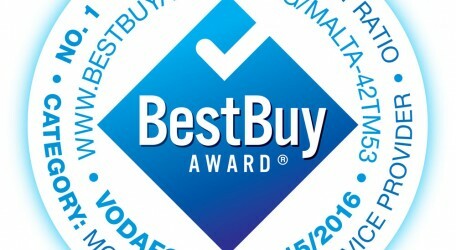 The ICERTIAS survey specifically asked consumers to select the provider that, in their personal experience, offers the “best price-quality ratio on the Maltese market.” This result indicates that Vodafone customers feel that the price charged for Vodafone’s services is the best available on the local market in terms of the quality and level of service it provides. Vodafone Malta has the only 4G network on the island which now covers over 80% of the population and which offers unrivalled speed which can be up to ten times faster than using 3G. Earlier this year it was also the first operator to provide High-Definition (HD) Voice technology which was made available to all Vodafone customers with an HD Voice enabled phone on both the 3G and 4G network and at no additional cost. HD Voice has been very well received. In April this year Vodafone also introduced RELAX, a worry-free pricing solution for postpaid customers that offers a flat rate of just 2 euros per 100MB of data used above their contractual limit and with notifications every time they use 500MBs of data. Best Buy Award certificates and medals (www.bestbuyaward.org) are awarded based on an independent market research performed by the Swiss organization ICERTIAS – International Certification Association which measure consumers experience, satisfaction and perception about the different products and services available on the market.